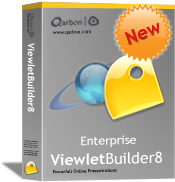 With one application gain the power of ViewletBuilder Pro, ViewletQuiz, PowerPoint import and much more! Create professional, interactive tutorials and simulations with ease! Develop interactive Flash-based quizzes and surveys in minutes! Store, Share and Track your Viewlets. HTML5 Authoring Solution. Web-based. WYSIWYG. Get tips and tricks to produce high quality Viewlets quickly and easily. When you would prefer to work with our staff over the phone to resolve an issue. Full service affordable creation and project polishing. or call one of our Sales Representatives at 1-855-VIEWLET (US & CA) and place your order over the phone. For customers outside the U.S. and Canada: You can search through our partner list or call 1-408-430-5560. 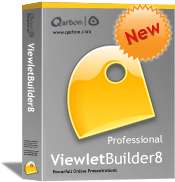 Communicate online quickly, easily, and inexpensively with Qarbon Presentation Software. Copyright © 2019 Qarbon Inc. All Rights reserved.